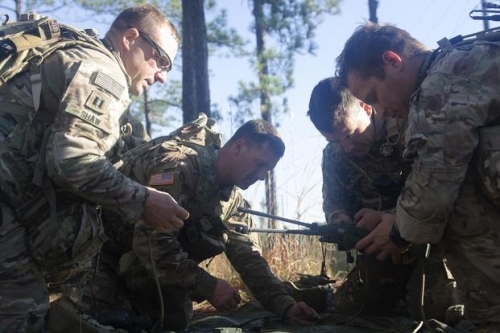 The Army is going to put technology innovators in the woods of Fort Benning, Georgia with small combat units as they conduct recon missions and attack objectives. When the shooting stops, Army officials want these captains of industry and academia to identify solutions to problems, dealing with tactical robotic systems, that service officials haven't thought of yet. "Innovation is sometimes in the eye of the beholder, depending on the perspective that you take," said Don Sando, director Capabilities Development and Integration Directorate at Benning. The October robotics innovation workshop will involve "small tactical teams such as rifle companies or scout troops and give them a couple of very distinct tactical tasks such as reconnaissance, deliberate attack or tactical resupply, and have them conduct those mission under various conditions, training environments, enemy conditions," Sando told a group of defense reporters in a telephone conference. "And then have the industry and academia experts help us define the problem we are trying to solve. ... We have used robotic systems for some time; we think the general problem set lies on reconnaissance and targeting with standoff and effective tactical resupply," Sando added. "Those particular areas can be most troubling for small tactical units, and we think there is great opportunity for robotics and autonomous systems to help that." Units will have all the technology that exists in the Army today, Sando said. "We do have air and ground robotic systems available today, so we will let them use it," he said. "They have been experimenting with it for some time, they expect to have it, we do have it in the field, so that will be the baseline." But technology often brings new challenges with it. "Sometimes when you create a new capability, you create another problem in a different area that wasn't a problem before," Sando said. The goal is to come up with new ideas and new solutions by having fresh sets of eyes observe combat units employ robotics in tactical situations. After-action reviews will hopefully identify some ideas, but academia and industry officials will return next April to present ideas on how to move forward, Sando said. "It's an opportunity to take some different eyes from different professions -- industry, both defense and others and academia -- to help us," Sando said. "We just started thinking about this idea this week, so exactly how we will do it, there is work to be done."